A better decision tree is available at psicode.org/installs/latest, though the below remains valid. I just want to run the code. I may tweak the Python, but I’m not developing anything to contribute back to the code base. Provided I still get good, threaded BLAS/LAPACK, OpenMP parallelism, and optimization for a variety of processor architectures (except Mac, which is least common denominator), I’m willing to forgo architecture tuning wizardry to avoid compiling it myself. I’m on Linux or Mac or Windows with Ubuntu Bash Shell. I want to run and develop in PSI4. 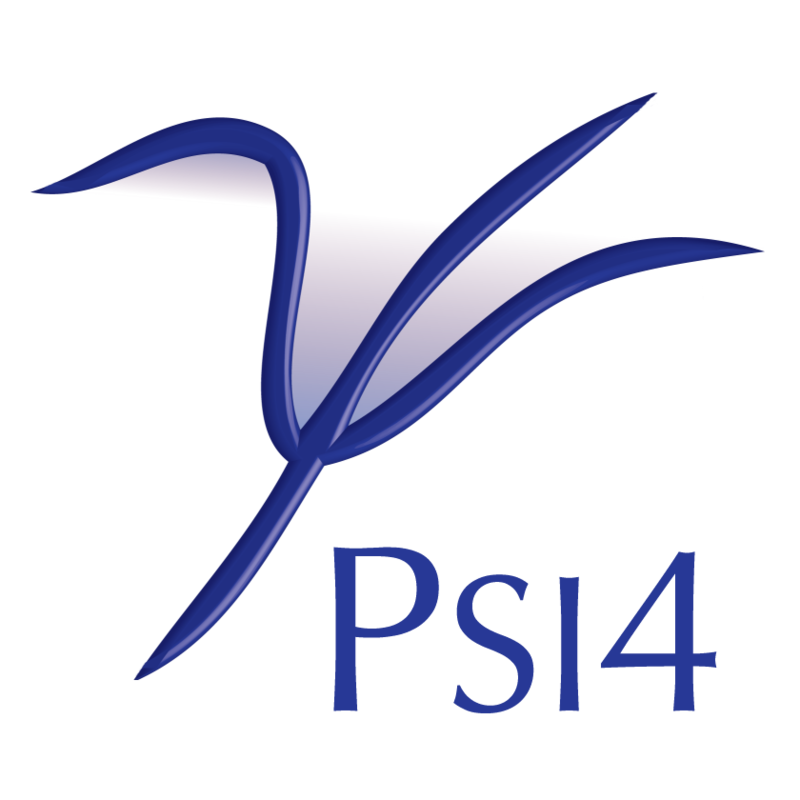 I want to develop using PSI4 infrastructure and libraries, not on them; I think a plugin might do. Just go to http://www.psicode.org/downloads.html and follow the instructions there. Not applicable as binary is pre-built. Not applicable as not under git control. The pre-compiled conda packages at https://anaconda.org/psi4/psi4 can be installed into an existing Anaconda or Miniconda distribution according to directions. Locally, install into a conda environment as below. The PSI4 repository at https://github.com/psi4/psi4 works like every other GitHub repo. Locally, clone as below. Contributions cannot be made directly to the main repository. Fork instead. To convert clone to fork, go to https://github.com/psi4/psi4, and hit the Fork button to store a PSI4 repository in your GitHub account. Set up a connection between your forked repository and the parent repository. Locally, update your fork from the parent repository and store on GitHub at your fork. 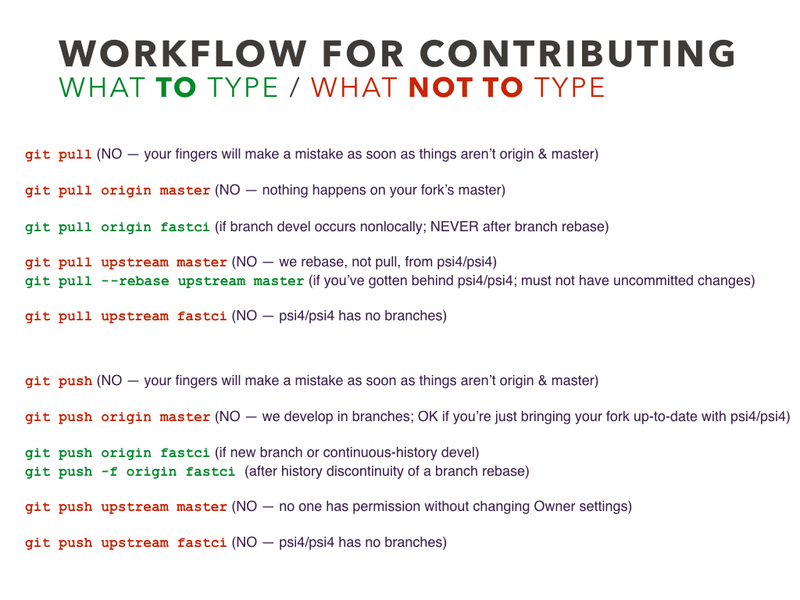 Remember: Working in the master branch of a fork is considered bad practice. PSI4 contributions process here and here. 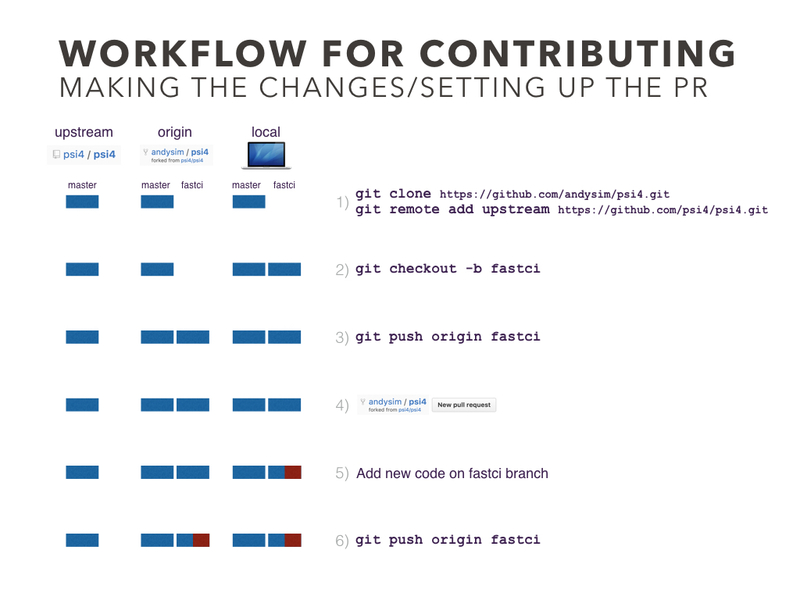 Consider preparing your contribution in a branch then issue a GitHub pull request. Discouraged! From the PSI4 repository at https://github.com/psi4/psi4, hit the “Clone or download” then “Download ZIP” button. Locally, unpack as below. Download new tarball and rebuild. Not applicable as source not under git control. Follow the INSTALL file that comes with the distribution. An old computer is probably handy for generating a working executable. This code is not under any development.